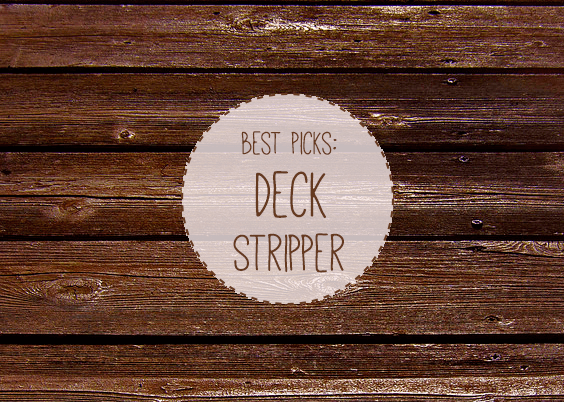 Welcome to my selection of the best deck strippers! If you’re getting ready to strip your deck of old stain, along with any clinging moss and dirt, then you’re in the right place. Along with reviewing my favourites and describing the best features to look for, I also offer some advice about distinguishing between deck stripper and deck cleaner. Click here to jump to our in-depth reviews of the best deck cleaners. Deck stripper is used for two reasons: to remove old stain and to clean the deck of dirt, mould, wood blemishes etc. Most commonly, deck stripper formulas are based on sodium hydroxide, a highly caustic compound that breaks down and emulsifies old stain. This chemical mix needs to be left for a short period of time before being washed off with hose water. There’s some confusion about the distinction between deck stripper and deck cleaner. They’re similar products but are meant for different purposes. In a nutshell, deck stripper is a stronger form of deck cleaner. Their chemical compositions also tend to be different. As already mentioned, strippers usually have sodium hydroxide as the main ingredient whilst cleaners use bleaches like sodium percarbonate (or “oxygen bleach). Generally speaking (and there is a degree of variation even between products of the same class), cleaners are suitable for removing dirt and organic materials (mould, lichen moss etc.) from new decking (that hasn’t been stained) and decking with heavily-weathered transparent and semi-transparent stain (see the image on the left). Stripper is required for removing semi-transparent and solid stain (along with anything weaker like transparent stain or sealer). For solid paint, paint remover is the best option. Stripper will also clean decking in the same way that cleaner will. No methylene chloride: Methyl chloride is bad. Fortunately, people are starting to catch on to the fact that it’s dangerous and manufacturers are adjusting their products accordingly. Biodegradable: Most products are now required by law to be biodegradable, but it’s always worth checking. 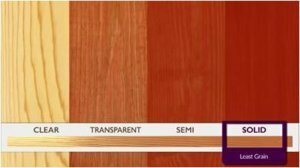 Paint or deck stripper: As mentioned, there are usually differences between paint and deck strippers, although the two can overlap. Paint rests on the top of the surface of wood. Stain, or sealer, penetrates it. The formulas in separate products are geared towards addressing this difference. Deck stripper will emulsify and disperse stain that has penetrated the wood more deeply than paint stripper. I’m a big fan of Defy products. The main ingredient in this mix is sodium hydroxide and the formula is caustic enough to treat the whole gamut of stain-types – from transparent to solid. It’s completely biodegradable and does not need to be left on wood for a long period to work effectively. One application is enough to remove even the hardiest, long-wearing stains. This bottle contains a gallon of mix and is good for about 150 – 200 sq. feet. It comes prediluted (so can be applied directly). The price is also very competitive. If you want a quick go-to that is certain to deliver, then I’d pick this one. In contrast to the Defy stripper, Citristrip incorporates N-Methyl-2-pyrrolidone (NMP) as its main ingredient. This means that whilst it’s still entirely safe and biodegradable (no methylene chloride), it’s also stronger than Defy Wood Stripper. Because of this, it can be used to remove even the most long-lasting of stains and paints. 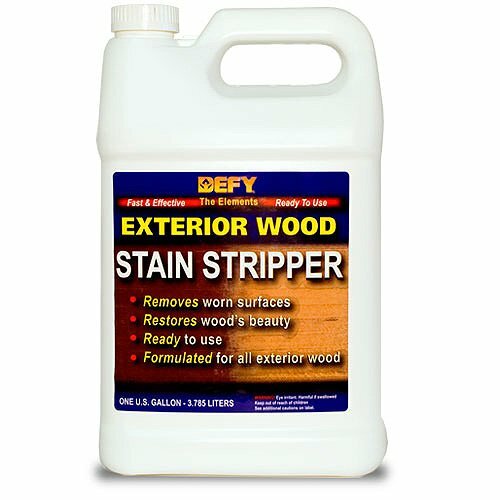 As a solvent stripper, it weakens the bonds between the stain and deck, as opposed to the caustic action of a stripper like Defy, which reacts directly with the stain molecules. Another interesting point about Citristrip is that it’s citrus-scented and completely safe for indoor use. This bottle contains 1/2 a gallon of prediluted formula. For tougher stains or paints it can be left for up to 24 hrs. For others, weaker stains, it’s good to be washed away after 30 minutes. Don’t put it down before a rainy night! This offering by Woodrich Brand is the most expensive on the list. 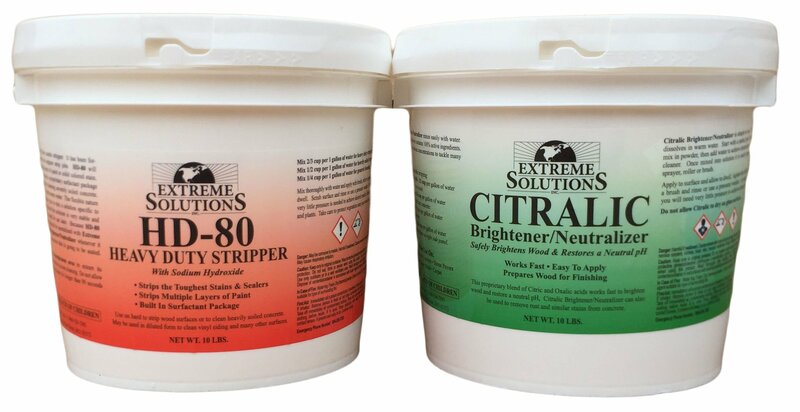 It’s a duo of two products – a stripper and a brightener – and covers an area of 3000 sq. feet. It comes in a powdered form so is very easy to store – small-space container gardeners pay attention! The main ingredient is sodium hydroxide and the dilution levels can be adjusted depending on how tough the stain is (meaning that you can minimise the chances of damaging the wood). This makes it the most versatile product on my list. In the long-term it’s also more cost-effective, though it does command a higher up-front price. As shown in the title, it comes with a deck brightener. You will almost always need to apply a brightener after using any stripper to restore the pH of the wood. Let us know your thoughts! Leave a comment below! What are your thoughts? Have you recently stripped and restained a deck? Have you tried any of the products on this list? Leave a comment below and let me know! Images: Deck at Dusk by David Strom. Just called Citristrip. He told me it will not work on stains. Hi Anita. Thanks for the update, I’ll include it in the article. I did do quite a bit of research before including it and there are a lot of reports of using it to effectively diminish and get rid of stain. Thanks again for the heads up though. Hi David. They shouldn’t do. Thoroughly rinse nearby foliage before and after application just to make sure.